1: George Clooney has done three films under the direction of the Coen brothers. They are: “O Brother, Where Art Thou?“, “Intolerable Cruelty” and “Burn After Reading“. These three films have been dubbed Clooney’s “trilogy of idiots” by the brothers. 2: During the filming of “The Passion Of The Christ“, Jim Caviezel (Jesus) was struck by lightning while filming the sermon on the mountain scene. Extras say they saw an illumination around his whole body. Amazingly enough, he was not seriously injured. 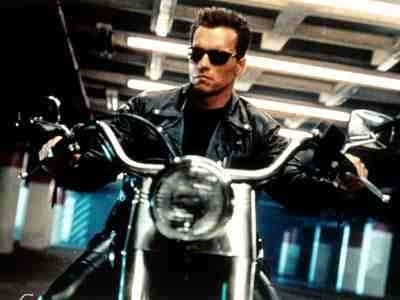 3: In “Terminator 2: Judgment Day“, Arnold Schwarzenegger received a salary of $15 million. The 700 words he spoke translates to $21, 429 per word. Thus “Hasta la vista, baby” cost $85, 716. 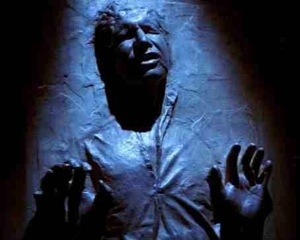 4: In “Empire Strikes Back“, Han Solo was frozen in carbonite. This was (at least in part) due to the uncertainty of Harrison Ford returning for a third film. When the original “Star Wars” was made, Carrie Fisher and Mark Hamill were signed on for a three picture deal but Ford refused. 7: In all of Quentin Tarantino’s original screenplays, the name of a police detective named Scagnetti is referred to at least once. Most of the times the particular scene was cut out of the final versions but Tom Sizemore actually played the role of police detective Jack Scagnetti in “Natural Born Killers“. 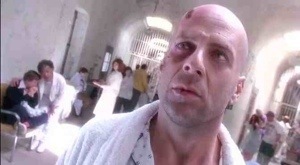 8: Terry Gilliam’s first choice for the lead role in “12 Monkeys” was Jeff Bridges, whom he had enjoyed working with on “The Fisher King“, but the studio wanted a bigger star, so he cast Bruce Willis. Ironically, Willis had originally auditioned for “The Fisher King“, but lost out to Bridges. When Willis got the role Gilliam gave him a list of “Willis acting clichés” not to be used during the film. 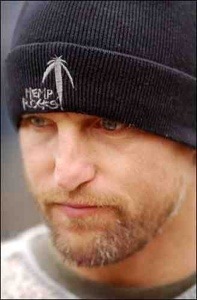 9: Woody Harrelson was arrested in 1996 for planting 4 marijuana hemp seeds in rural Kentucky and in his defence he said he was challenging a state law that makes no distinction between marijuana and hemp, even though hemp contains little of the drug found in marijuana and can be used to make a variety of industrial products. The jury dismissed the marijuana possession charge against him. 10: Stanley Kubrick considered both Robert DeNiro and Robin Williams for the role of Jack Torrance in “The Shining” but decided against both of them. Kubrick didn’t think DeNiro would suit the part after watching his performance in “Taxi Driver“, as he deemed De Niro not psychotic enough for the role. He didn’t think Williams would suit the part after watching his performance in “Mork & Mindy“, as he deemed him too psychotic for the role. According to Stephen King, Kubrick also briefly considered Harrison Ford. This entry was posted on October 23, 2012 at 9:04 am and is filed under Uncategorized with tags 2012. You can follow any responses to this entry through the RSS 2.0 feed. You can leave a response, or trackback from your own site. 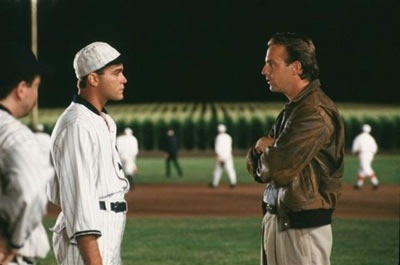 The De Niro/Williams one is strange, as much as I’d love to have seen Bobby in that role, Nicholson is just perfect. Thank you sir! You’re first out the traps on the comments. Totally agree on Nicholson. 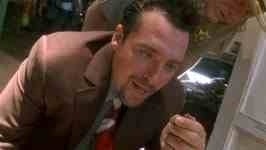 It would have been interesting to see DeNiro but this is one of Nicholson’s finer moments. Yeah catching up on emails and just posted another desert island castway, and then up pops your trivia so it would be rude not to check it out! Nicholson took over De Niros role in The Departed too, that would of been another role to see Bobby rock in! Haha. Thank you for your consideration. Yeah, I’d loved to have seen DeNiro do The Departed as well but again Nicholson excelled in the role. Apparently DeNiro had commitments to The Good Shepherd at the time. Cheers Vinnie. Glad your still enjoying them man. 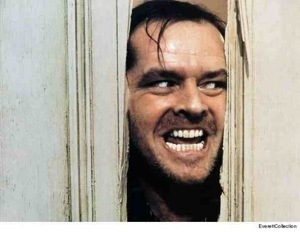 Now I’m thinking what Robin Williams would be like as Jack Torrance. Nice trivia. I can’t really see it myself. He could capture the mania but not the menace. I could see DeNiro doing it though. Thanks man. It’s bizarre thinking of de Niro as not psychotic enough after watching Taxi Driver. Whether that comment was to be taken with a pinch of salt, i don’t know. I agree Chris. DeNiro can do psychotic with the best of them. Bravo! More cool bits of information. You touched on several of my favorite movies, actors, etc this week. Another great list. Can you image how different their careers would have been had someone else got cast in The Shining. Crazy! It could certainly have given us a different career path of Robin Williams but as it’s stands Nicholson owned that role. One of many by him that couldn’t be beaten. Cheers Ryan. Great list! I knew about Caviezel being struck by lightning, Someone must’ve been looking out for him that day as he could’ve easily been killed. Did you know he’s also accidentally whipped during the flogging scene, twice I think, which left a scar on his back. Man, talk about suffering for your art. I love Caviezel, he’s so criminally underrated! Ahah, De Niro deemed not psychotic enough for The Shining?? I find that hilarious! I didn’t know about the flogging. Nice info. Yeah, it would seem that Caviezel ended up doing a little method acting there 😉 I totally agree on him though. Quite underrated and he was superb in The Thin Red Line. DeNiro not psychotic enough? What was Kubrick thinking? He must have missed something there. Thanks Ruth. Ahah yeah, that’s what I thought about Kubrick. Especially after he saw him in Taxi Driver, ahah. 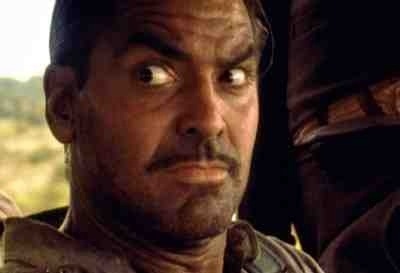 As for Caviezel, I don’t normally like war movies but I LOVE The Thin Red Line because of him. I think he should’ve been nominated for The Passion of the Christ, but I think because of the subject matter, Hollywood shied away from it. It’s too bad as his work should be judged on its merit, and it was a spectacular performance. He definitely exudes a depth in his characters: Tortured, philosophical souls. I always feel quite sorry for him but most of the time, that’s what he wants from an audience. I’d like to see more from Caviezel as he’s starting to slip away a little. Never considered Robin Williams to be too psychotic, though he’s a pretty mental choice to play jack torrance in the first place. Some more great trivia mark, keep it up! Thanks again Henry. Yeah, Williams can certainly be maniacal but I honestly can’t picture him playing Torrance. 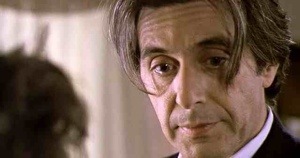 It’s hard to imagine anyone after Nicholson’s superb display but DeNiro is an intriguing choice. Nice series you’ve got going here Mark, this one’s a big hit. Love it. Never knew that about Han in Carbonite! Wow… thats a stroke of good fortune, huh? Seeing as thats one of the coolest parts of the trilogy! Thank GOD Kubrick landed on Nicholson. Can we all agree on that? Cheers Fogs. Yeah, people seem to be enjoying the feature and some even looking forward to it every week. When I first started promoting it, I thought it wasn’t going to live up to the hype but it has, I think. Thank god for the Internet right enough. How else would we get info like that on T2? I’m new to the Han Solo one myself but it’s makes sense for them to cover their asses incase Ford dropped out. You’re right though, it’s one of the best bits of the series. I think you’re aware of my liking for DeNiro Fogs but yes, I’m totally in agreement with Nicholson. I wouldn’t change him for anyone in that role. Thanks again buddy. Great stuff, as always bud. 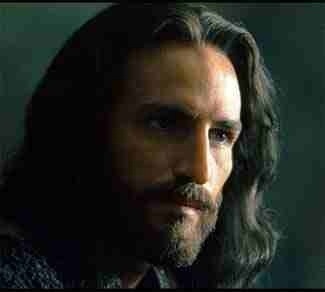 The Passion of the Christ one freaks me out and has me wonder why God hasn’t been able to bless Caviezel’s career after the movie came out. Cheers Dan. Yeah good point on Caviezel. He was brilliant in the film but his career has seriously dipped since then. Work of the lord d’ye think? Robin Williams in The Shining would have been interesting but oh, oh, so bad. I totally agree Nick. It’s one that you can run around in your head but in reality it would be a different deal altogether. Thanks for chiming in man. Haha yeah. Apparently one of them was “the steely blue-eyed look”. (I’m not making that up) No idea what the rest were but I could imagine a couple. Yeah, the Christ one certainly is spooky as for Clooney and his trilogy of idiots, I just love that description. I hope it doesn’t mean that they will leave it at a trilogy though. I think Clooney and the Coens are a good match and I’d like to see them do more together. Thanks for stopping by Sati. Loving this weeks trivia! I’m glad Han Solo came back. As someone above said the carbonite is one of the best scences in the trilogy. Still can’t believe my hubby doesn’t like the films! Lol I don’t think he’s ever watched them all the way through. He’s not a big sci fi fan. Not a big Sci-Fi fan? Man, that’s probably my favourite genre after crime. You must make him sit through Star Wars. The original three at least. Shame on you! Don’t get me wrong. I’m not a mad Star Wars fanatic but I grew up with them. They will always have that appeal. I would have thought that you’d have grown up with them as well.? Wow, interesting stuff. Robin Williams in the Shining would have been very weird (looking back of course). Even though I still have not seen the movie I do know the classic Nicholson line from it. You’ve never seen The Shining Nostra? That surprises me. You must remedy that at once. Still, like you said… Even having not seen the film, everyone is aware of Nicholson’s iconic character. Williams just wouldn’t have cut it. Cheers man. No I haven’t, but that’s mainly because of the genre it’s in. But I am planning of checking it out soon as I’m pretty close now of reaching my goal of having seen 225 movies out of the IMDB top 250 by the end of the year. Since it’s a list that is constantly changing I need to see the ones which are high on the list and The Shining is one of them. This week I saw Braveheart for the first time and I’ve currently started watching Ghandi. 225 is an impressive score man. I take it your not big on horror then? I’m not overly fussed by it either but that mainly because most of it’s crap. The Shining is great though. Braveheart is favourite of mine but I honestly struggled with Gandhi a bit. It was a bit too lethargic for me. Have been working on reaching that number for a while, it’s currently at 219 so unless there are going to be big changes to the list I’m sure I’ll be able to reach it during the last two months of the year. I’m not a fan of horror at all. I actually don’t watch it unless it’s got humor, so something like Cabin in the Woods, Zombieland or Tucker and Dale. Since the Shining is so high on the list it must be good, so therefore I will have to watch it. The Shining is a classic of the genre though. I’m not surprised it’s on the list. It’s not my favourite but still a damn good film. It takes a lot for me to enjoy horror and that’s mainly because it doesn’t really scare me. If one gives me the creeps then that’s how I rate it. The Shining delivered on that front. All but the T2 one were new to me! I’m shocked I didn’t know the Star Wars or Shining trivia. Bravo, once again, sir. Thank you sir! If truth be told, a lot of these were new to me too. I only found out in my rummaging for new material. *giggles* Thank goodness, no. 😉 It was Bobby Jones – this golf movie made in the early 00s…2002 or 2003 maybe? I’ve never heard of it. Is it any good? Was it worth being an extra in it? Sounds like a good laugh. I wouldn’t mind being an extra one day. I considered applying to be a zombie when Brad Pitt was filming World War Z in Glasgow, my home town. I never went through with it but I really wish I had now. You should do it someday for sure. It’s a great way to learn your way around a set and learn some cool stuff. 🙂 AND that would’ve been so wicked awesome!! They started shooting Walking Dead in Atlanta like the year after I left which was entirely sad-making. If the opportunity arises again, I’ll probably go for it. They ask a lot of your time though and that’s what put me off. Still, being a zombie has to be the best and most fun extra you could play. Lol, I feel ya. Sleep and food are rare occurrences for me these days. Thanks Fernando! They’re still going strong it would seem. Long may they last. Thanks Mithil. It is quite a strange little event that though isn’t it? I’m not religious at all but it does get me thinking.